The growing number of supermarkets, cafes, and hotels across the world is the key reason for the currently increasing demand for refrigerated display cases and chilled rooms. More than half of the commercial sales of refrigerated display cases have been made to the food service and food retail industries over the past few years. As their numbers grow, so will the demand for refrigerated display cases and chilled rooms to store food and beverages. Prominent retail chain operators are also showing a further increase in the demand for refrigerated display cases and chilled rooms by penetrating the markets in the emerging economies. They are steadily shifting focus from the highly competitive and matured markets of North America and Europe towards Asia Pacific and Latin America. The use of refrigerated display cases and chilled rooms has also increased post the growing awareness of retail chain operators and individual store owners of the dangers of storing certain foods without refrigeration. This is further boosted by the increasing stringency of food safety and quality regulations. Manufacturers of refrigerated display cases and chilled rooms, however, must develop solutions for the challenges such as the high energy consumption rates of most refrigerated display cases and the high purchasing cost of cold rooms. Owing to the above factors, the global market for refrigerated display cases is projected at a CAGR of 11.2% from 2014 to 2020. By the end of 2016, this market’s revenue is expected to reach US$12.47 bn and US$19.69 bn by 2020. The CAGR for the global chilled rooms market is expected to be 9.9% from 2014 to 2020. By the end of 2016, this market’s revenue is expected to reach US$15.90 bn and US$23.51 bn by 2020. 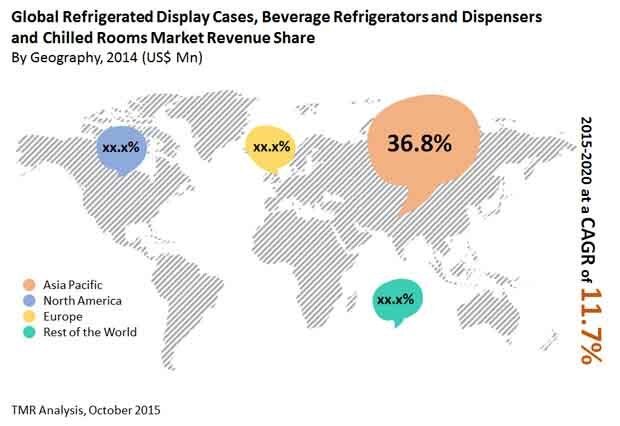 The demand for refrigerated display cases and chilled rooms is expected to be led by Asia Pacific till 2020. By 2020, this region is expected to generate a revenue of US$8.54 bn in refrigerated display cases and US$10.57 bn in chilled rooms. China and India, along with a few other Asia Pacific nations, have shown an excellent economic growth rate that is conducive to the growth of many markets and industries, including those relevant to food service and hotels. Not only is the region demanding for a larger number of refrigerated display cases and chilled rooms, but is also willing to invest in the latest equipment for the same. This is encouraging globally prominent manufacturers to focus on Asia Pacific for the coming years. North America has been in second place as far as the demand for refrigerated display cases and chilled rooms goes, in the recent past. This is likely to continue being the case till 2020, with Asia Pacific still leading in demand. Both North America and Europe are currently very saturated in terms of player presence and the demand is not enough to suffice the high level of competition here. As a result, a lot of stronger players are looking to other regions for better business. Refrigerated display cases are commonly found in two types: plug-in and remotely controlled. Plug-in RDCs are expected to continue leading the overall revenue generation till 2020, owing to the very high demand for them and their relative ease of use and better energy efficiency. Plug-in RDCs also require lesser maintenance in comparison to remote RDCs, adding to their preference. Chilled rooms are commonly present as walk-in cooler rooms, walk-in freezer rooms, and walk-in hybrid rooms. Walk-in cooler rooms are expected to retain dominance in sales till 2020, owing to the wider range of food that can be stored in them. The key manufacturers of refrigerated display cases and chilled rooms from a global perspective include Lennox International, Dover Corporation, Standex International, Frigo Glass, Illinois Tool Works Inc., Hoshizaki International, Hussmann Corporation, Manitowoc Company, Inc., United Technologies Corporation, Epta Group, Blue Star Limited, Sanden Corporation, and Metalfrio Solutions S.A. The research report on Refrigerated Display Cases (RDCs) and chilled rooms market provides an in-depth analysis of the global market with a cross-sectional view of different segments categorized on the basis of product type and product design. The RDCs product type segmentation includes plug-in and remote RDCs, while product design segmentation includes vertical, horizontal, and others (hybrid/semi-vertical). Based on type, chilled rooms market is classified into walk-in cooler rooms, walk-in freezers rooms and walk-in hybrid rooms. The report provides an insight into the growth trend during the period 2014 to 2020, with regional breakdown into North America, Europe, Asia Pacific, and Rest of the World (RoW). The analysis covers the market estimates in terms of revenue and forecast for the period 2014 to 2020.